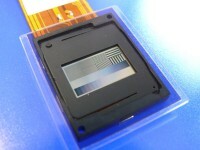 LCOS (Liquid Crystal on Silicon) is a reflective microdisplay technology based on a silicon backplane. Using standard CMOS processes, microdisplays with extremely small pixels, high fill factor (pixel aperture ratio) and low fabrication costs can be realized. LCOS micodisplays in consumer projection products typically have lifetimes >20,000 hours at operating temperatures of +10°C to + 70°C for the visible waveband (420 – 700 nm). HOLOEYE offers monochromatic and color field sequential microdisplays. For single panel color projection a color field sequential (CFS) display addresses three monochromatic images corresponding to the primary colors (RGB) in a repetitive sequence and is illuminated by a triggered light source. HOLOEYE offers drive ASICs and standard drive board solutions for evaluation for several mycrodisplay types. HOLOEYE also offers customized development of drive electronics, flex cables and display packages. HOLOEYE specializes in custom designs using LCOS to meet the requirements of industrial customers. We offer design, prototyping and manufacturing services.